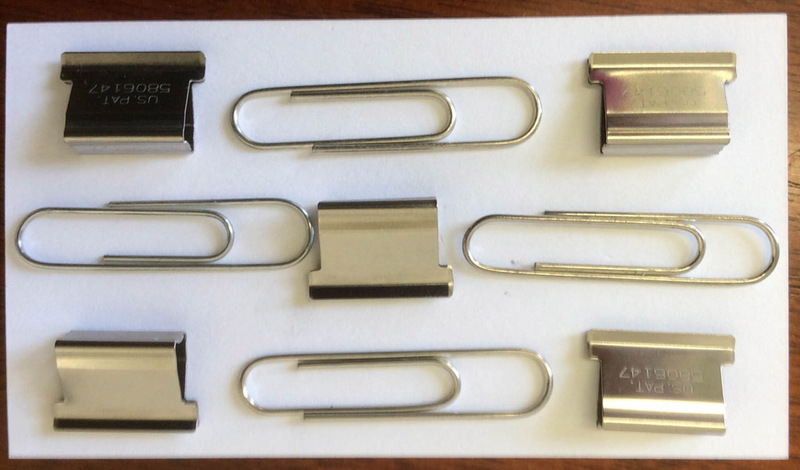 Today I decided to make an artwork starting with just a couple everyday objects: an old business card and two kinds of paper clips. I placed the clips in a simple pattern on the card and snapped a photo with my iPad. I think there is a time in almost every project where it looks ugly and rough. That’s the time where it takes faith to step forward. I struggle with that point a lot. It helps me most to treat every artwork as play. The more seriously I take myself, the harder it is to complete anything. It’s much easier when I can just focus on the process not the end result. So, the process. With the picture in my iPad, I know I want to make the piece more abstract and colorful. I’m an avatar, after all. Abstract and colorful is what I’m all about. Today I want the the original objects to influence the final piece, but lose their identity as recognizable objects. I use various apps I have collected on my iPad to filter and modify the photograph. I save the processed image and run it through other filters, bring it back and run it through again. I may try 100 combinations, save 15 or so different looks, and then choose a final one or two to carry through to the next stage. Here were a couple I liked. I worked a bit with the first one, but then went back and ended up using the second. Ok, making progress. The marks don’t look like paperclips anymore, but I don’t want the image to just be a photo filter mashup. I want to push it further and give it more personal, hands-on attention. One of the best apps for art on the iPad is ArtStudio. It is a mini photoshop: a really cheap, good, mini Photoshop. 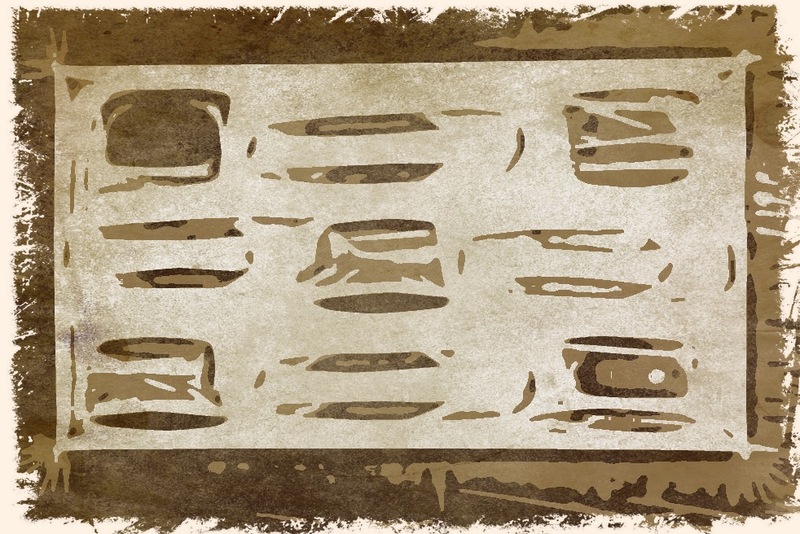 These images are already looking like hieroglyphics to me, so I bring the image into the ArtStudio app and use the emboss filter. I adjust the settings to give it depth and make it look like a clay tablet. I lose all the original color in the process, but that’s fine, I can add color later. 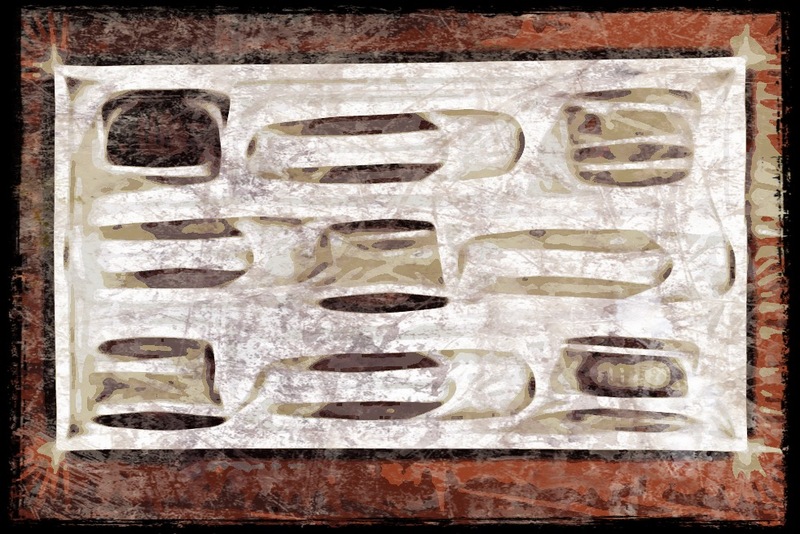 Using an ArtStudio filter called elastify (like photoshop liquefy), I push and twist the pixels of the embossed shapes. It feels like I’m playing with the clay. The raised parts that were originally the paperclips in the original image get more wavy. I start imagining the Nile river. Maybe a Spring morning in ancient Egypt with the wind blowing through the reeds and the dawn light lighting up the pyramids. Ok, time for some color. I make a layer and paint on an overlay of color. I’ve been choosing fuchsia lately and indulge myself again. Then I paint a yellow on the raised part of the image. I paint this on another layer, loosely and not too perfect. I erase some bleedover that I don’t like, dab a little red here and there to vary the color, and–I think I’m done. I’m pleased. I like the rough clay-like texture between the raised parts. I also like that the spirit of the original objects live on in the final work. The rectangle of the no nonsense business card, the half-circle ends of the paperclips, the simple pattern of the original all carry through. The color is fairly pleasing to me. I feel like there would be other combinations that might even be better, maybe a blue with gold. I wish I knew more about combining colors. I think I will look at pictures of paintings that appeal to me. I can sample their colors in Photoshop and come up with my own color palettes to use. Color is one area where I could really improve my work. Anyhow, at this point its time to set the creation free. For some reason I value my work more when I send it out into the world. Just knowing people might see it brings the process to closure. Having the friendly, kind audience of other learners at MU has been such a great experience in that regard. . .oh, Oona just faved this one on Flickr. I couldn’t be more pleased. So I’m done with the piece, except I want to bring it in to SL to see how it looks on a prim. How will it look repeated several times? Or stacked in a tower? Or huge? How about an article for MU creativity blog? The finished work becomes the seed for new work and the process goes on. Hope you enjoyed this glimpse into what making art is like for me. I would love to learn how others approach their own projects. This is an amazing idea and a great, glimpse into how you personally create things. I love this article!!! I love how you express your creativity Neeva, and paperclips are a wonderful little subject! The flow of this article reflects the imaginative playfulness Ive been lucky enough to witness up front with your artwork. What you do with sampling colours in photoshop is a fantastic idea that I really encourage everyone to try! Its a great way to draw a palette out of something you love, a painting, a flower, a birthday cake.. Etc.. And bring that world of colour into your piece! Great article! Nice article, Neeva! I love how you describe your process. I’ve been admiring that work on Flickr. I would have no idea you started with paperclips, it has so much dimension. Thanks for the comments. For some reason part of the game of making this piece was to hide the paperclips while still keeping enough of their essence that I could see them in the final work. So glad you enjoyed the outcome.